Right now all the restaurant talk in DTLA is about Red Bird and Bestia (as it should, as they are both amazing restaurants) but if you can’t get reservations for either of those places or want to try something new, don’t overlook The Factory Kitchen. It is located in the Arts District in a former factory building on a dead end street off Alameda. Don’t be fooled by the location, The Factory Kitchen is a trattoria-style restaurant that serves up some of the best traditional Italian food in DTLA. Everything on the menu has some fancy Italian name, so when it came time to order, we did a lot of pointing. Okay, here is why you need to eat at The Factory Kitchen… so you can have their Peperu. 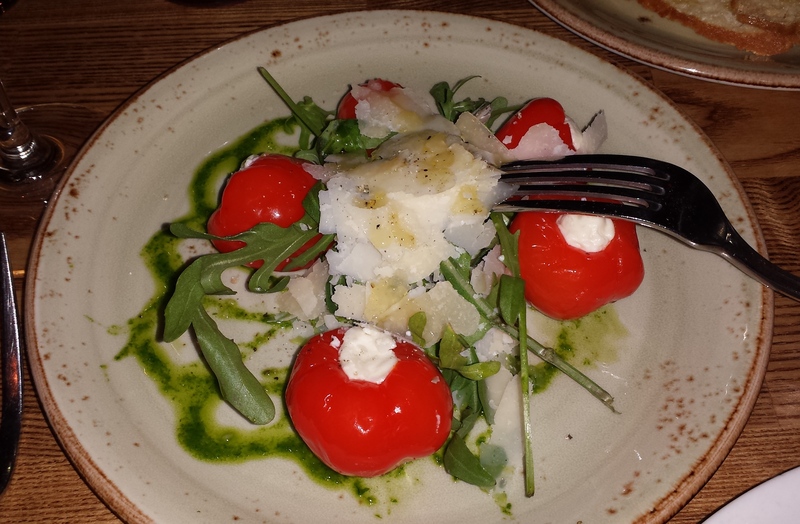 These are stuffed sweet & spicy red peppers stuffed with a soft cheese and topped with arugula oil ($8). They look like they were going to be fire hot, but they were not. The little bit of heat from the peppers is offset by the creamy cheese. Seriously, this one of our favorite dishes in all of Downtown Los Angeles. 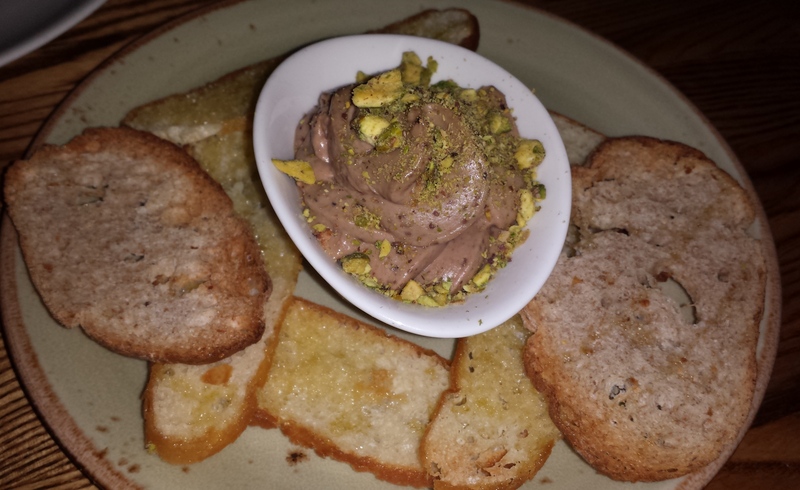 Up next was the Fegatini which is duck liver topped with crushed pistachio, served with house made crostini bread ($8). There was no way my husband was even trying it, but I loved it. This is clearly a dish for sharing. There is no way one person can eat the entire portion. Then came the prosciutto platter served on lightly fried sage dough ($18). It was good but not our favorite dish of the night. Don’t get me wrong, we cleaned the plate. We also ordered the broccoli di cicco with shallots and calabrian chili ($7). It was good, but at the end of our meal this was the only thing left over. We were apparently starving when we ordered because we also got a focaccina calda di recco al formaggio with fungi ($21). Translation: a fancy mushroom pizza. It was a little doughy. I would have liked it a little more crispy. And finally, we got the Mandilli Di Seta ($18). 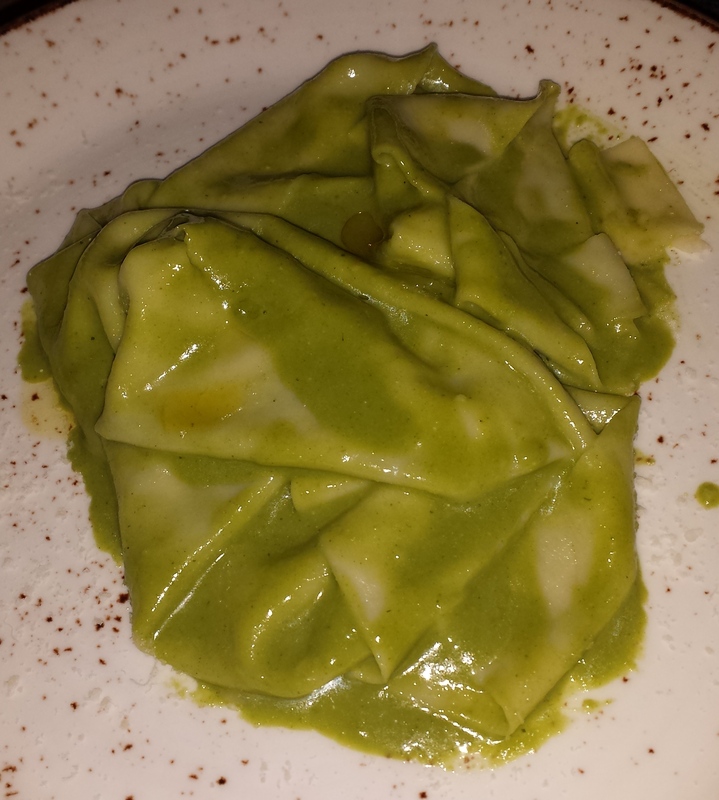 This is their signature handkerchief pasta made of an almond basil pesto. It was so light and delicious. This is another one of the items that you must order. Now you really didn’t think we left without ordering dessert. 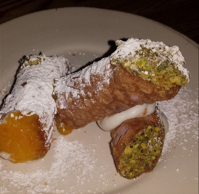 We finished the night with a trio of cannolis ($9). They were your traditional cannolis filled with ricotta and topped with pistachios, but then they added orange marmalade. We were not really sold on the addition of the marmalade. Dinner for two at The Factory Kitchen will set you back at least $100, but if you are celebrating a special occasion, it’s well worth it. I just heard that they have added a special happy hour bar menu on Monday thru Thursday 5pm to 7pm. See you there. This entry was posted in DTLA Restaurant and tagged Arts District, Downtown LA, Downtown LA Restaurant, Downtown Los Angeles, DTLA, DTLA Restaurant, Factory Kitchen, Italian Food, Restaurant, The Factory Kitchen. Bookmark the permalink.